Sprains to the ankle are one of the most common sporting injuries. A sprain is defined as a tearing of the ligaments that connect bone to bone and help stabilise the joint. Sports requiring jumping, turning and twisting movements such as basketball, volleyball, netball and football; and explosive changes of direction such as soccer, tennis and hockey are particularly vulnerable to ankle sprains. The ankle joint is a hinge joint formed between the tibia and fibula (bones of the lower leg) and the talus (a bone of the foot) and allows the foot to bend upwards (dorsiflexion) and downwards (plantarflexion). The joint also allows a small amount of rotation. Two bones of the foot, the talus and calcaneus (heel bone) connect to form the subtalar joint which allows the foot to rock side to side (inversion/eversion). On the inside of the ankle (medial side), the joint is stabilised by a thick, strong fibrous ligament called the deltoid ligament. Sprains to the deltoid ligament (eversion sprains, foot twists outward) account for less than 20% of all ankle sprains. 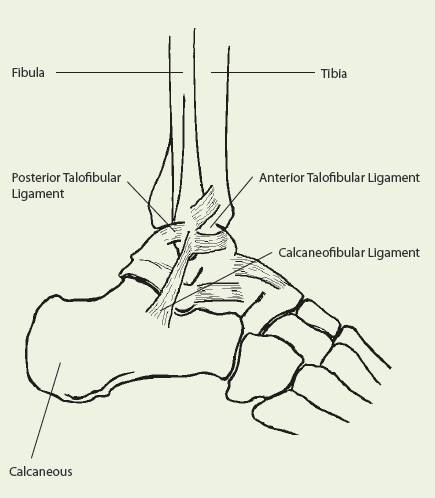 On the outside of the ankle (lateral side), the joint is stabilised by three smaller ligaments; the anterior talofibular (at the front), the calcaneofibular (at the side) and the posterior talofibular (at the back). Sprains to any of these ligaments (inversion sprains, foot twists inward) account for more than 80% of all ankle sprains. The inferofebular ligament can also be injured. Injury to this ligament can be a cause of prolonged recovery from a sprain. Ligament sprains to the ankle joint may also involve the ligaments between the tibia and fibula bones. These injuries may involve a fracture, are often slower to recover, and may require surgery. Acute ankle sprains result from a force being applied to the ankle joint which causes excessive range of movement at the joint. Players are immediately aware of the condition and may hear an audible ‘snap’ or ‘pop’, due to the tearing or stretching of the ligaments. Lack of, or extreme flexibility, in the ankle joint. Inappropriate, inadequate, or no warm-up. Sprains are graded on a scale of 1 to 3 (mild, moderate, and severe), depending on the degree of tearing to the ligaments. In most cases, x-rays are performed to rule out a fracture or dislocation. The immediate treatment of any soft tissue injury consists of the RICER protocol – rest, ice, compression, elevation and referral. RICE protocol should be followed for 48–72 hours. The aim is to reduce the bleeding and damage within the joint. The ankle should be rested in an elevated position with an ice pack applied for 20 minutes every two hours (never apply ice directly to the skin). A correctly sized compression bandage should be applied to limit bleeding and swelling in the joint. Most ankle sprains heal within 2 to 6 weeks, however severe sprains many take as long as 12 weeks. A comprehensive rehabilitation program minimises the chance of the injury recurring and includes flexibility, balance, stretching, strengthening and sport specific exercises. During this time taping or bracing the ankle may be prescribed to provide support until full function is regained. If, while performing a rehabilitation exercise, ankle joint pain or discomfort is experienced, stop immediately and reconsult a sports medicine professional.